A very nice CNC router for the money. Customer purchased a new $150,000 CNC system to replace this one, but this machine is still in production. Great for a small shop. We need to gain space for new machines coming in. Serviced by one of the best techs in Ontario. He was trained by Homag and is a specialist with these machines. All the units on this Homag Brandt KD 97 are very heavy duty and in AMAZING condition. This is such an incredible deal! If the machine is sold locally, we will ALSO include set up, training, and GUARANTEE the machines' performance! Single combi head, drum and pad. 37 inch x 60 inch sanding belt, 3 phase machine. Owner retired form business. 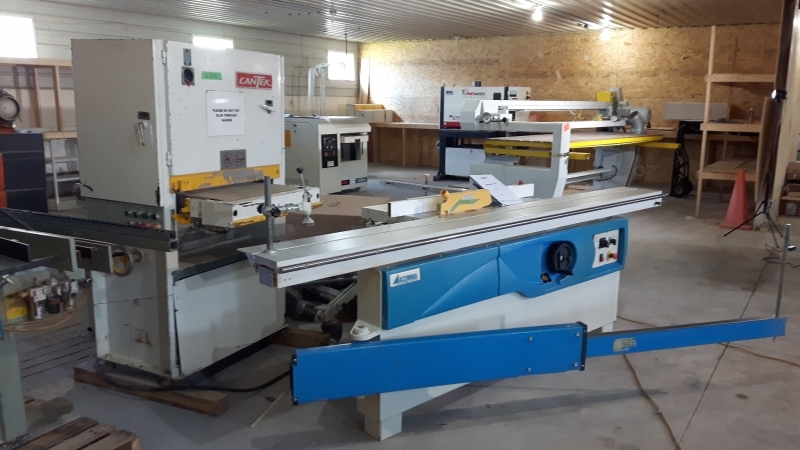 This Boring Machine is complete with: 4 Pneumatic stops, 2 pneumatic holddowns, fences, hydraulic brakes on vertical heads, and foot pedal control. The copy corner rounder Casadei Model CRH Edgebander does its job with the panels held well in position. This characteristic simplifies a lot the corner rounding unit workmanship which can be found on large and complex machines. The saw carriage slides on 8 bearings, having dust scrapers which guarantees complete cleanliness of both the interchangeable steel tracks and the bearing. Self-centering locking in the main angles position of the arm, the motor and the carriage with the possibility of manual locking at all intermediate angles. Easy and extremely practical unlocking of the arm rotation on the front. This double door clamp is perfect for a production or very custom shop. When new it cost approx $8400 Canadian.